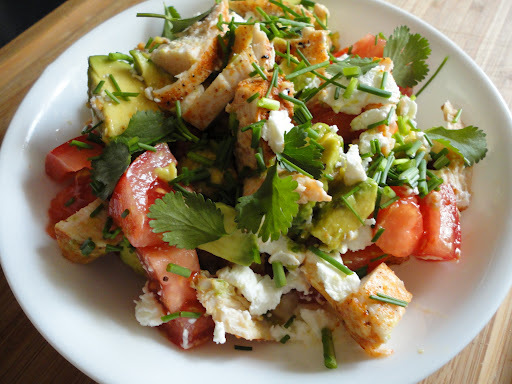 It’s stifling hot today – making a semi-cool salad perfect for lunch. Coat the chicken breast in a barbecue spice blend (mine had some salt, sugar, and paprika), and cook at 350F for about 12 minutes – you don’t want to to dry out (I usually encase it in aluminum foil). Prepare the vegetables and herbs while the chicken cooks. Once the chicken is cooked all the way through chop it into bite-sized cubes, and mix everything together! (Besides ice-cream… mmm) what’s your favourite thing to eat when it’s hot out?